One of my jobs at MSCC is to stay plugged into the social networks and 99% of this interaction revolves around the world of old iron. This is normally a positive world because the old car hobby is like Disneyland with big block engines. Walt Disney said it best back in 1955 at the dedication, “To all who come to this happy place: Welcome. Disneyland is your land. Here age relives fond memories of the past, and here youth may savor the challenge and promise of the future. Disneyland is dedicated to the ideals, the dreams, and the hard facts that have created America, with the hope that it will be a source of joy and inspiration to all the world”. What happens when a thunderstorm hits Disneyland? 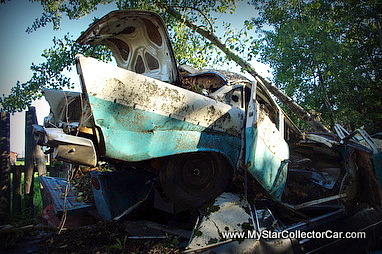 Recently I found out what happens when a guy posted a story about a devastating crash that wrote off his ’57 Chevy four-door. 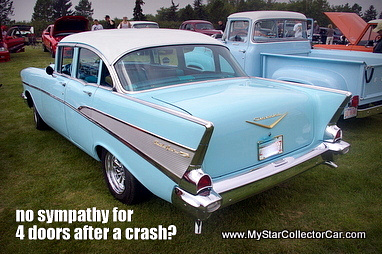 He’d owned this classic for 20 years and in a cruel twist of fate, the crash happened the first day he had it out after a major restoration. This was a full-blown car guy tragedy and I posted my sympathetic comments because I could feel this guy’s pain even though I never met him. I expected a flood of sympathy to follow because real car guys think that way but nothing prepared me for the vile comments I saw after mine. Here are a few examples-bear in mind I’m not going to edit these guys because the stupidest comments are also the most incoherent. I saw a pattern that begged to be left intact for full effect. Is this where we’re headed as a civilization? The guy was a victim of yet another texting and driving crash and all these clowns do is heap scorn on the man and his car. I blame it it on the ease of communication in 2013 because you never have to stand behind your opinion in cyber-world. There’s no accountability in this realm because you can bask in anonymity behind a fake name so there’s nothing heroic or insightful in these comments. Worse yet, they’re not even coherent thoughts-most of them wouldn’t pass a grade three grammar class if we still had grammar classes in grade three. I stick to the old-fashioned rules in communication…“would you say the same thing to the guy if he was right in front of you?”. They’d be pulling this ’57 Chevy guy off everyone of these guys if they had the stones to make the same comments at the accident scene. Personally, I’d take my time pulling him off any one of these clowns. These aren’t car guys. They’re antisocial idiots with a keyboard and and an ax to grind with society so this hapless ’57 Chevy guy makes a handy punching bag. “Car guys feel the pain. Non car guys are just moaning haters”. 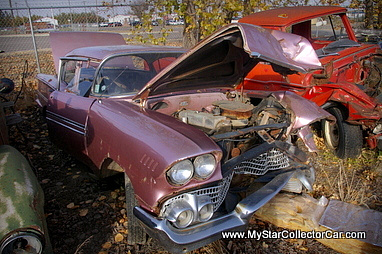 “We develop a relationship with a car when time and love is spent in restoration. It’s not really about the money although it’s easy to see how he might have spent a lot of money on it over the years. Mourning is the right word in this instance…..you’ve got to feel for him”. That’s how real car guys think.